This beautiful bird, the Great Egret (Ardea alba), is one of the birds I see regularly on my walks along the Carson River. I was able to capture this wonderful photograph one day. Early this year, while Older Son was visiting and helping me around the house, we took The Girl out for a long walk along the Carson River. We staged from Riverview Park, which is at the end of Fifth Street on the east side of Carson City. The weather was a beautiful winter day. There was plenty of water in the river, although nowhere near flood stage. That meant all the wetlands were, well, wet. The wetland wildlife were out and active on that beautiful winter day. We came across this beautiful Great Egret, (Ardea alba) working the ponds in one of the wetland areas. I had only my Olympus OM-D M10 and a Wollensak cine lens with me. The lens was long enough, but I couldn’t get the capture I wanted. I was left with, well, only feathers. The Girl waited patiently while Older Son and I made our captures. When she detected that we were done, she started toward the water, accelerating as she got closer. The egret watched her from his watery perch. (I knew she wouldn’t get into the water.) When she got close to the water’s edge, she bounced and uttered a single “Woof!” The Egret calmly flew off a few yards, settled back down, ruffled his feathers, and continued fishing. Since that time The Girl and I have seen this bird, or another like it, several times on the river, fishing. If I’m in a blind, then the bird goes on without noticing me. They have very sharp eyes, however, and will spot me (or The Girl). A couple of weeks ago I had the Fuji X-H1 and the Fuji 100-400mm super telephoto zoom with me. 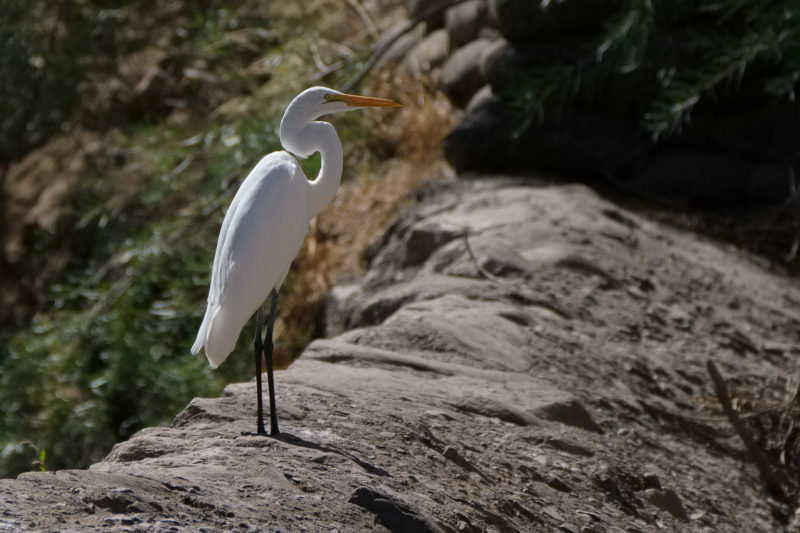 The Egret was perched on Mexican Dam. The Great Blue Heron flew away as I approached the dam. The Egret watched me for a bit, permitted me to make a few captures, and then flew a few yards away to a sandbar. There it continued watching me. I made a few more captures but didn’t really like any of them. I like birds quite a lot. They fascinate me. I like being along the river, too. The new equipment provides me some capability I did not have. It has opened some of the world for me to capture, like this Egret and the Heron.